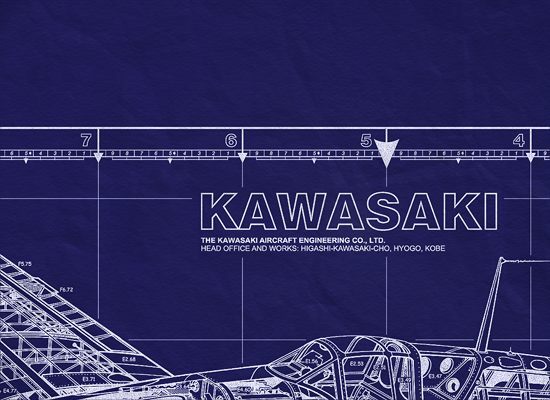 One of Japan's first aircraft companies. It developed numerous successful aircraft for the Imperial Japanese Army. One of the first Ki-100 units destroyed 14 F6F Hellcats over Okinawa in their first major encounter - without loss to themselves. 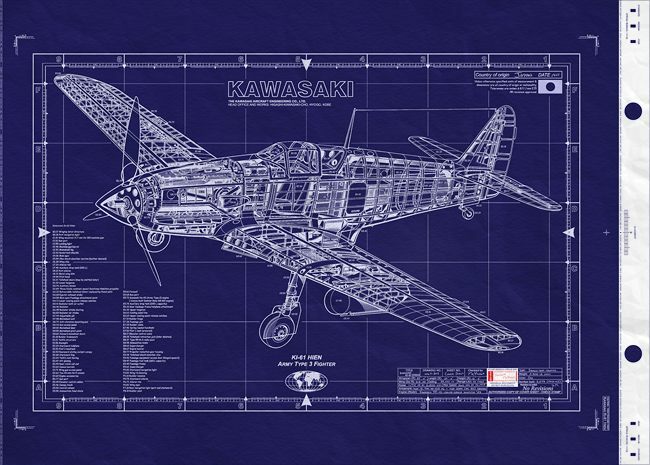 From 1923-1933 Kawasaki hired the noted German Aerospace engineer and designer, Dr. Richard Vogt, to assist with design work and to train Japanese engineers. — most B-29 bombers lost to Japanese fighters were shot down by Ki-61 aircraft. A real blueprint, developed direct from a vellum master -- expertly restored from old design drawings, factory plans, microfiche revision plates etc. 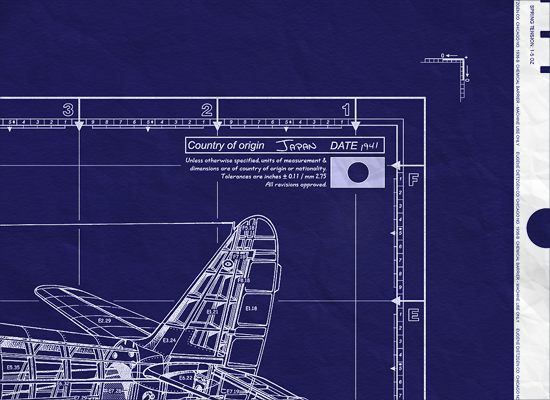 Note: all reasonable efforts have been made to keep this blueprint historically accurate, with a balance for technical accuracy and usefulness -- this blueprint is offered for historical, research, and collectible purposes. Size: Developed on 42"x 30" master sheet. This Japanese fighter had actually been designed as an improvement of the famous German Bf-109 fighter… the engine was a license built copy of the Daimler-Benz which powered the Bf 109. Continued from above… service with the Japanese air arms during World War II. 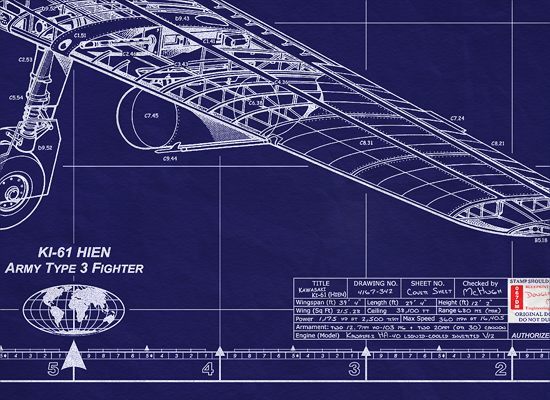 The Hien scored many aerial victories against the Allies, and it also pioneered the use of armour and self-sealing fuel tanks that had been so useful in Europe. The Hien entered combat in the spring of 1943 in the New Guinea war zone, covering New Guinea, the Admiralty Islands, New Britain, and New Ireland. The new Japanese fighter caused some pain and consternation among Allied pilots, particularly when they found out the hard way that they could no longer go into a dive and escape as they had from lighter Japanese fighters. 5th Air Force Commander General George Kenney found his P-40 Warhawks completely outclassed, and begged for more P-38 Lightnings to counter the threat of the new enemy fighter. The Kawasaki Ki-61 Hien ("Swallow") fighter represented a major departure for Japanese aircraft design in World War II. While other Japanese fighters were designed with air-cooled radials and were optimized for maneuverability, the Ki-61 used a liquid-cooled in-line engine and was designed for speed and power. In fact, the Ki-61 was so different from other Japanese fighters that when the type was first encountered in combat over New Guinea in June 1943, the Allies thought it wasn't a Japanese design at all. At first they believed it was a copy of the German Messerschmitt Me-109, then suspected it was a copy of the Italian Macchi C.202 Foglore or similar Italian fighter. For this reason they gave it the code-name "Antonio", or "Tony", though by the summer of 1943 the Allies were convinced the Ki-61 was in fact a Japanese design.